You know teens and tweens are usually really into the whole "kingdom of isolation" idea, but we’re guessing that there's no way she’ll want to keep this cool look a secret! Do you know what else tweens love? Comfort. Ease. All the benefits of something, without a whole lot of the effort. Behold! 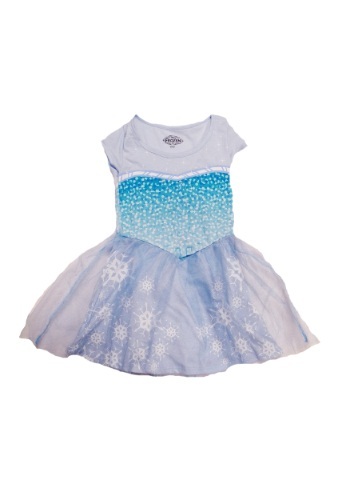 Our Tween Frozen I Am Elsa Dress is bound to transform your little princess into the character Elsa from Disney’s film Frozen, but, you know, without a bunch of hassle. Perfect! And bonus: once she has this dress on, she won’t be able to hide in her room anymore; all her pals are going to want to snap pics of this fun frock. And double bonus: there’s no place for her cell phone, so she may have to actually interact with the real world the whole time she’s wearing it! Specific, icy details like a glittery tulle skirt and allover snowflake design help create Elsa's signature look, without your gal actually needing to banish herself completely from society or carve an entire castle out of ice (this is great news, since she has that huge history project due right after Halloween). In this unfettered yet unforgettable frock, your gal will look so absolutely magical, it will melt the 'eternal winter' of her tween heart. You may even get a “thank you” and a hug, to boot! Talk about fun for the whole family!